Sticky Rubber: Star-patterned sticky rubber sole provides excellent multi-directional traction and no grit, mud, debris or snow pick up. This outsole can also be customized into a "studded" bottom with several after market solutions. The best boot out there for anyone who walks or wants the lightest weight possible. The notched flex zones really help with wear and tear over the long haul. With only one minor flaw: The laces split on the quick lace holders. They are tough to see when lacing your boots. Not a big deal, but something to look at. Noted on the potential for the speed hook to "split" the laces. This is more a function of the flat style lace. We have found through testing a variety of water products that flat laces stay tied better than cord. If our flat lace does get "speared" it doesn't hurt it's structural integrity.....but I am always looking to improve. Thanks Mat. I'm glad you are digging your Riverwalkers. I'll be the first to admit that I haven't seen these in person, but the side by sides I've seen on the website with the old and new (done by searching: riverwalker) seem to give a decent comparison of the color change. I really wish you guys had left the color on the riverwalkers alone. I can't help but feel that when wearing these with a pair of Watermaster Waders I should be fighting Rommel in the deserts of Africa. The khaki everything is a bit much. Minor gripe, but it needed to be said. Noted on the military nature of color in just about any fishing line Ian but the former Riverwalker came in 3 different hues based on outsole type, Retro Khaki - sticky rubber, Loden - felt and Jute - felt w/ studs. For the sake of fabric yield efficiency (less waste) we moved to Marsh Green for all boots. Marsh Green is shown blending in well on the Boulder river in the "Turned Tail" photo. With all that said, which previous color did you prefer? I haven't really considered the color of my wading boots as being particularly important in camouflaging myself, but they do blend in rather well in the picture you mentioned. It seems like the moss green color really looks more khaki-ish in the photos I've seen. As I said, I haven't seen them in person though. I own the previous version of the Riverwalkers in both felt and sticky rubber. Although I noticed they're slightly different, I can't say I prefer one color over the other. They both seem darker than the marsh green. All that being said, you could make these boots pink and purple and I'd still buy them. I haven't found another boot that comes close to the Riverwalkers. On an somewhat unrelated note, thank you for continuing to offer non-studded sticky rubber soles. I can't understand why some manufacturers only offer studded Aquastealth, especially when they're so easy for the user to add. I know this post is discussing the Riverwalkers, but... quick question. I just looked at the Canyonwalkers somewhat closely for the first time. I see a really strong resemblance between the Canyonwalkers and the original Wading Shoes. Is there any similarity in fit and sizing? I loved my Wading Shoes. Well, I don't want this to come across as negative, but I think honesty is important in product refinement. While I've appreciated the design, fit and lightweight of the Riverwalkers, I hope durability issues have been addressed with the update as well. I went through 3 pairs of Riverwalkers that all had quality issues (two of those 3 pairs had < than a week's use on them, the third pair began seriously de-laminating on both boots, after < 2 months of use). Of course, Patagonia did a great job of replacing them for me, which was much appreciated. But by the time the 3rd pair started falling apart, well, you lost me. While I was a big fan of the old Beefy Wading Shoe, I'm leary of investing in another pair of Riverwalkers until I see how the new update lasts. I have heard a few complaints similar to smithhammer; however, I have Riverwalkers that precede the current generation and I'm delighted with them. I'm pretty hard on my gear considering I have a penchant for cathartic environments (see Before the Runoff) and have yet to experience any product failure. Also, they are one of the only boots fitting a extra wide (I'm EEE) foot well. If I have a choice between multiple color choice or minimizing waste, I'll take the later as long as the single color option is reasonable. I have considered testing an elastic pull-stop lacing system. Has anyone attempted? Thanks for the detailed reply Ian...and thanks RJ for wading into position. Ian, What screw in technique/stud do you use? Pattern? Conditions used for? Regarding Canyonwalkers, they are constructed with a "cut and buff" midsole. The Beefy Wading shoe had that kind of midsole. 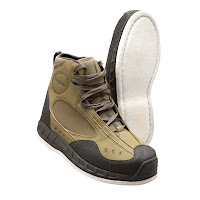 The Riverwalker has our molded Rockstopper midsole. Overall the last (fit), materials, and lacing system are similar between Riverwalker and Canyonwalker. We are able to offer the Canyonwalker at a bit lower pricepoint due to construction efficiencies and slightly lower cost construction methods thanks to an excellent team of developers and buyers combined with good factory partnerships. Both shoe styles will get the job done but only the Riverwalker comes with a sticky rubber sole. I've been using sheet metal screws for studs because they're easy to install and remove with a leatherman, and a coin will do the trick to remove them in a pinch. I only have to resort to studs occasionally. I used them a lot in canyoned rivers in New Zealand where they were helpful in getting up steep banks when we were gorged out and had to hike up steep inclines. Three studs in a triangle pattern (two under the balls of my feet and one under my toes) worked really well in that application. Those were pre-didymo days, so I only used studs for those situations. For slick rivers the same triangle pattern in addition to a four stud square near my heel seems to be the best pattern I've found. Non-studded sticky rubber is ideal for what I deal with in Alaska. The river is mainly pebble and pea size gravel, so felt doesn't offer any advantage in the river, but felt does tend to slide around a lot on the slick wooden decks and aluminum of the jet boats. I did notice that the rubber sheath material has changed on the Riverwalkers. Awesome. The textured pattern on the previous version grabbed fly lines if I was careless and let the line fall near my feet. Thank you for the comments Smithhammer. I don't think you were the only one "we lost" due to felt delamination issues. To make a long story short, we discovered that there was a bonding problem with a certain production run of felt Riverwalkers built in 2005. Every pair of boots has a "cut tag" on the tongue which is how we figured it out. Unfortunately we didn't discover the issue until the faulty batch was well dispersed through the supply chain. Sounds like you got 3 pair. Since then we've worked closely with our dealer base to weed out any remaining 2005 felt boots. Note that we've seen no significant issues with 2006 or 2007 felt production and we've never had issues with studded felt or sticky rubber. Most of the 2005production was fine and is still going strong today. Due to the examination of this issue though we did learn some things that have been implemented into the 2008 redesign. Most notable is that felt is bonded to a rubber "carrier strip" and then bonded to the midsole. We are also stitching the felt to the carrier strip for added durability. I'd like you to test the new version out Smithhammer. What's your shoe size? I appreciate your comments John. Your early generation sticky rubber Riverwalkers should continue to serve you well on into the future. On a product note, clarify "elastic pull-stop lacing system". Ian, shoot me a few pix of your sheet metal stud configs via email as time allows. No need for anything high res. Thank you sir. Thanks for the background info and the honesty. This ability to provide feedback and have dialogue around product development is great. Hi -- considering the riverwalkers stickies after years of felt with studs because of didymo, and have a few questions. First, on the studs, are you guys using hex head sheet metal screws, rather than just flat or round top screws, and how long a screw? Simms actually makes screw in studs with hex heads, made of carbide, but they look a little long. Second, how does sticky rubber compare to aquastealth? I've had some say "it's not even close to aquastealth in traction," while other say the Patagonia formulation is better. I take it all with a grain of salt, but let me know what you think, and thanks for any help. I REALLY need a new pair of boots! I'm using zinc hex screws from Lowe's. I seem to recall settling on 1/2" when I bought them. I don't use them often enough to know whether or not they're a good substitute for carbide. I haven't used Aquastealth, so I can't help in comparing the two. The sticky rubbers are not the equal of felt, and you'll be disappointed if you purchase them expecting them to be. I can say that there are certain rivers where sticky rubber flat out doesn't work. It must be a specific type of rock we have in some rivers in the Southeast, because there are specific rivers where the sticky rubber doesn't work well, and others where it's not an issue. 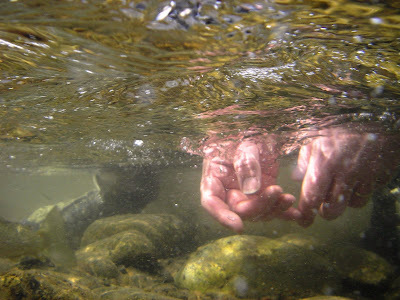 The sticky rubber excels on small creeks where you spend most of your time rock hopping. Sticky rubber grips the smooth dry rocks that felt seems to slide on. "Elastic pull-stop lacing system" is my attempt to explain Chota's "Quicklace System". It features a round elastic lace with the two loose ends feeding through a spring-loaded mechanism. The mechanism releases when pressure is applied to a button and holds laces fast in no pressure state. It is a pretty nifty system, particularly when hands are cold. My only complaint, is the elastic cord Chota uses seems to be of poor quality or the design is flawed as the laces need frequent replacement. As for the Chota boots, I think they are poor quality and design. My first and replacement pair actually shrank to the point I could not use them. I'm waiting for exactly that type of system before I buy my next pair of boots! Golf shoes are moving that way, so are skates... hopefully wading boots aren't far behind. You basically turn a knob on the back of the shoe to tighten the 'laces'. Fishing on the east coast, mainly for salmon, mainly in cold water, it's too often painful to be tugging at and tightening laces. Thanks for considering Riverwalkers Jonny. Check out this post link and comments on screw-in studs - http://www.wayupstream.com/2007/03/sticky-rubber-soles.html. There are some answers in there to your screw type and size questions plus some configuration details. Very good comments Ian. I agree that at this time sticky rubber alone doesn't answer all needs....but I'm working on it. John and JockScott, I will look closer at the "quick lace" dial concept. I am familiar with it from the world of snowboarding. I did see that Choata was using it for wading and as mentioned, skate and golf are going this way too. The saltwater angler in me is wary though. Saltwater isn't typically friendly to springs and mechanisms. Keep sharing ideas. Thank you. 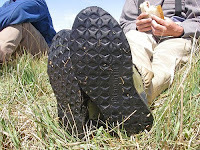 I have used Patagonia sticky rubber soles from the beginning and participated in the early testing. In my experience, these are the best all-around soles on the market. Are they perfect for all bottom conditions?, no, but neither is felt or any other sole. I do think you get the most bang for the buck with sticky rubber. Other than slimy, snot-covered rock, they work well on pretty much everything else. Here in the Midwest we have clay, sand, silt, gravel, flat rock, round rock and everything in between to deal with. Add walking through snow into the mix and the sticky rubber shoe is the hands down winner. It is lightweight, comfortable, has excellent support, picks up very water weight, and snow does not stick to it. For studs I have been using 3/8" aluminum sheet metal screws and have a couple of the originals still holding after two seasons of use. I use a regular screwdriver to insert them into one of the "star" patterns on the sole. Three or four put in around the ball of the foot and a couple on the heel and you are good to go. If they happen to fall out or you take them out, the rubber is self-sealing and the hole closes, so no harm done. el pes- You are right to be wary of the systems and mechanisms related to the BOA technology. Korkers use the BOA and fishing the searun cutts out here has rendered the BOA virtually useless. I have to soak the BOA in fresh water overnight if i plan on using them the next day. Fair enough on the potential saltwater issues. I guess every system has it's drawbacks. Maybe I will have to settle for another pair with laces afterall! Thanks for showing me the other side of the coin. Great value in discussions like this! Agree on the BOA system, in that it is prone to malfunction. I would wonder how well it work with lot's of fine sand. My Riverwalkers have held up well, the stitching is blowing out along the toe rand, but so far the rand has stayed in place. Having a wide foot, this wading boot is the first one of ten other pairs I have owned that fit well. I'd have to agree with Fish Dog. For the best all around versatility, the sticky rubber is the best. They last longer than felt when hiking allot. In that respect alone, it's more sustainable. I've used mine in a variety of situations and terrain. Mine have lasted longer and been more comfortable than any other brand of boots out there and i've worn allot of different boots over the years. I really haven't had any mayor problems or blowouts with my current pair and they are going on three hard seasons. I went through 5 pairs of Simms Guide boots in just 3 seasons before that. I've also worn Korkers. They have a better fit than simms, but the Riverwalker yet fits better and wears better. I helped Brian Chanley with the development of the Boa system in Korkers. I was familiar with the system from my days riding and reping for Vans. I help test the system out from some of the earliest snowboard model boots. I've seen allot of the problems worked out and have had great sucsess with the system on the snow. The Boa has been all i wear while snowboarding for the past 6 years and still now. Because my boots are often wet, I figured it would work well in the water too. I have to admit that neither i, or any of the designers i talked to put much thought into the salt water aspect. I wore one of the first run Korkers Boas for half a season. It worked fine. Bit bulky and yes, susceptible to sand and dust. Although they are most often protected by the gravel guard at all times. Also a bit stiffer feel to the boot than with laces. Kind of nice for support, but not so great for long hikes. Not sure of the sustainability of the Boa for longevity of use in all types of water conditions. I didn't wear the boots long enough to find out if the boa broke before the rest of the boot fell apart. I haven't changed the laces in my riverwalkers yet hopefully they will last the life of the boot. I used to change the simms cord laces all the time. Also had to carry an extra pair of the regular Korker laces. I really liked the old green color too, but it's nice to show a change in the line once in a while. Green, Tan, Brown, Grey all earthy colors are good and found in different situations underwater. I think the best camo isn't the color, it's the breaking up of the colors. to a fish, any mass of solid color stands out more then broken up patches of colors. The vents and laces and tung break the colors well on this boot. I also like the rummer toe and heel guard and how it helps break up the silluette of the boot's shape as well as provide extra grip and durability. When buying a boot and examining your options for spikes, please keep in mind environmental impacts. Spikes put allot of wear and sometime un- necessary tear on the the river bed and softer rocks and especially riparian habitats along the river and underwater habitats for insects. Felt leaves the least prints and therefor impact, but has the worst traction along the rivers edge. Sticky rubber combined with the toe and heal shape on the Riverwalker maximize traction and midigate impact. Try to only use spikes when you have to. The screw in option seems to work well and combined with stickyrubber, offers the best versability on the market. With Korkers you would have to carry tree different soles in you backpack. I've also found that placement of the studs can make a difference in traction and impact. I use three in the toe area in a cresent moon shape. I don't put any under the ball of my foot. I place the next two just under the arch and two more near the hell. Leaving the ball of your boot clear, allows you to balance on the top of rounded rocks better while rock hoping or deep wading. Spikes can slip on smooth granite and become very dangerous if you have to make a jump. The screw in sheet metal screws are softer than carbite and mark the rocks less. If anything starts to go on your boots, try shoe goo first. I guarantee fish don't care what your boots look like. It can work good on waders too and makes great heads for kraft fur streamers. The BOA system has been applied to some applications like water skiing and wake boarding. I'll investigate further to see how it works in the salt. If stitching wear occurs on your wading boots I recommend dabbing a little Seam Grip on the spot. This will seal the loose end and prevent further stitch loosening. The Surf Sneaker and Marlwalker are two different breeds. The Marlwalker is built for walking. It has ankle padding and a stiff insole board. It offers a solid platform a flats prowler needs. Though a thin sock is commonly suggested as a compliment, I recommend a thicker sock (Midweight) with some loft. This adds a bit cushioning plus limits sand chaffing better than a thin sock in my opinion. The Surf Sneaker is for scrambling the shore break, rocky outcroppings or for in and out of watercraft. It's flex pattern is softer for deck shifting and "running down the man". There is no extra padding which makes this style our fastest dryer. It's a saltwater Chuck Taylor. I recommend our Insulator Sock with gravel guard for this shoe or the same Midweight sock suggestion as above. That will give you adequate padding. Lastly, keep in mind that it's important to secure your footwear over the arch well but be careful about over tightening around the ankle. Hand tightening is enough. Tourniquet tightening at the ankle is not good. I wanted to clarify a statement I made about the Surf Sneaker. I said that there was no "extra padding". Note that there is padding in this style that completely surrounds the ankle. It's just that the Marlwalker has extra layers/zones. I'll put the Marlwalker and Surf Sneaker into the "to post" pile if anyone's interested. Thanks for the various responses, all. I did get the Riverwalkers with the sticky rubber, put in the sheet metal screws as recommended, and so far so good. Waded my home waters this weekend (the mainstem of the Delaware) and seemed to have solid traction. The Delaware is not the slipperiest place, but it does have all the bottoms -- mud, sand, cobble, boulders, etc. -- and so far the boots felt fine. EP: "Lastly, keep in mind that it's important to secure your footwear over the arch well but be careful about over tightening around the ankle. Hand tightening is enough. Tourniquet tightening at the ankle is not good." I petitioned for lace locks to allow for zoned tightening on the riverwalkers, but recently came across an article on hiking boot lacing that suggested (for lack of a better description) double over-handing the laces in the transition from arch to ankle. I've found the the friction in the double over-hand keeps the laces from slipping and allows me to keep the boots tight over my feet but relatively loose over my ankles. Good lace tying information Ian. There has been a lot of research and suggested methods coming from outside of the fishing sector that could really help anglers. Feel free to share technique articles and sources with the Way Upstream community. "I was wading up to my chest about two weeks ago, it occurred to me that I have grown very comfortable with the Sticky Rubber soles. I will admit that for a while, I was very nervous and in fact had taken a spill or two that I had convinced myself were the fault of the dreaded sticky rubber soles! I am now convinced that it was MY carelessness that caused the bruises suffered to my ego and backside. A good indication as to the suitability of a product for me is that after a short time, I am no longer even aware that I am using something new. 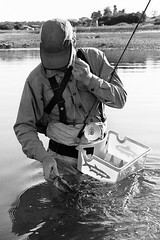 It seems that there is a period of adjustment for me to become comfortable with an item that is as important to an angler’s comfort and safety as wading shoes. Also there is a widespread belief among anglers that nothing is as good as felt. While not true, it is so ingrained that we take such a statement as the gospel truth. I am extremely happy with the Sticky Rubber and now would NOT go back to felt, also I'm much more open to new technologies as they come along!"